Interior decorating is about the process and that process begins with trust. Together we start with the conceptualization and creation for your space through ideas, information, objects, style, furniture, and more to bring the vision for your home together and into reality. Every project is unique our individualized process helps our team to form design concepts and a style foundation. It is that foundation that we build on to create or transform any space in your home. This can only be done with trust, and we are grateful to all our past, current and future clients for their trust in A Jolie Design to make the spaces they spend the most time in shine. Broward County Interior Design & Architecture Firm- 3x Best of Houzz! Broward County Interior Designer Best of Houzz 2015-2016! Best of Houzz award-winning Jenny Velasquez Design, a division of JNJ Design Group LLC is a boutique residential design and consulting firm serving South Florida and Washington DC. Principal designer and founder , Jenny Velasquez, brings over 18 years of experience in design consulting, project management and sales. The firm consistently exceeds clients’ expectations with personalized service, the best quality for their budget, and on-schedule completion, allowing for a stress-free, enjoyable experience in creating the space of their dreams. The key to our success is to LISTEN! The success of each project comes from our ability to interpret clients' needs and thus provide a unique, personalized design. Each design is a reflection of the client's own personal style and taste. Jenny personally oversees every aspect of a client’s design process, whether the project is a single room or an entire house. From Inspiration to Installation Jenny is committed to her work ethic, ensuring each project runs smoothly, on time and within budget. Our goal is to create a beautiful space that you will be proud to call home, while delivering the highest levels of customer service and professionalism. The Frances Herrera Interior Design team provides clients with sensible, uniquely tailored solutions to recreate their space as a functional, luxurious haven. The firm consistently exceeds clients’ expectations with personalized service, the best quality for their budget and on-schedule completion, allowing them a stress-free, enjoyable experience in creating the space of their dreams. Acclaimed for her “livable luxury” design principles, Frances Herrera has quickly become one of the top approachable and coveted interior designers since establishing her design firm in 2002. Whether designing a modern, contemporary or traditional space, her philosophy remains the same: to create comfortable, livable rooms with an under stated, sophisticated edge. She is most recognized for her ability to create welcoming, harmonious, sanctuary-like homes that feel polished and refined. “I don’t follow trends,” Frances said. “I let my clients’ passions and interests dictate the emotion and feel of the home. Ultimately, I design homes that progress over time and reflect my clients’ ever-evolving lifestyles.” Frances’ flare for transforming spaces and her infectious energy have captured countless fans, making her a natural TV personality and style expert. She has appeared numerous times on NBC’s Open House, George to the Rescue and LXTV’s On the White Carpet. Her work has also been featured in several publications including City and Shore Magazine, South Florida Luxury Guide, Boca Life Magazine, Florida Decor Magazine, and The Miami Herald. Boca/Ft. Lauderdale Interior Designer - 6X Best of Houzz Winner! Broward County's Interior Design Firm Best of Houzz 2015-2017! 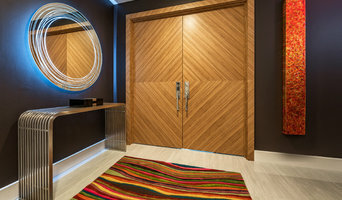 Robyn Hughes has been providing a coordinated approach to interior design that captures the essence of each client’s unique personality. Through an appreciation for all elements of design, Robyn has acquired a perspective of combining both functionality and aesthetics. An interior design graduate of The Art Institute of Ft. Lauderdale, Robyn has been working in the field of Interior Design for over 25 years. Early in her design career she owned and operated a Custom Cabinetry company that specialized in high end woodworking for 8 years. Her experience and expertise in this area has been an asset in the many design projects she has completed. Robyn is a professional member of the American Society of Interior Design (ASID) and is licensed with the State of Florida. Robyn has a vast experience in a variety of styles from traditional to modern. She has created many unique and distinctive projects that are centered on her clients tastes and lifestyle. Whether a simple renovation or an elaborate new construction, Robyn Hughes Interiors provides a full range of design services that can take a project from conception to completion. Robyn personally supervises the execution of all projects with an uncompromising eye for quality and detail. With a strong commitment to excellent service and customer satisfaction, Robyn has established many client relationships that have been filled with multiple projects over the years. 18 years design experience in San Francisco, Houston, and Florida. I am inspired and find joy in the positive affect that interior design has on customers. The business model is simple - I bring to the table extensive resources, a hugely varied background with many influences. Collaborating (and sometimes nudging) a customer to create their sublime and functional space. A Civil Engineering degree allows me to work seamlessly with architects and contractors. We also manage the budget from the beginning so that you know where you are at, at all times. Give me a call and let's discuss your project! 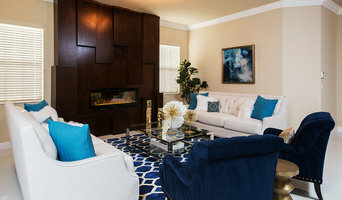 Fort Lauderdale and Miami Interior Designers: www.meredithmarlow.com Meredith Marlow's Interiors has received acclaim and numerous industry accolades. The spaces she designs are sophisticated, refined and unique. They are both softly modern and classically clean lined. She states, "We are in the business of beautiful spaces and pride ourselves on being able to interpret the unique style of each of our clients. Customer experience is always number one. We see ourselves as advocates for the client as we guide them through the process of creating beautiful and functional spaces." It is this approach that has earned Meredith and her qualified team of experts both the trust of clients and a reputation for being at the top of the field. Meredith holds a degree in Interior Design as well as a Master in English Literature from the University of Miami. She spent over 4 years as a Commercial Designer for San Francisco and Miami based Architecture firm Tsao Design Group. There she designed many hotels, restaurants and retail spaces. Meredith and her projects have been seen in the pages of Luxe Magazine, Architectural Digest, Apartment Therapy, Voyage Miami, HGTV.com and many others. However, the real satisfaction is in the positive feedback and warm relationships she develops with her clients. MMI is voted a favorite in customer service and continuously receives The Best of Houzz Service Award chosen by a community of homeowners. Meredith has solidified her place in the forefront of her industry and is often called upon to design large, complex and highly detailed jobs. She specializes in the luxury and ultra-luxury market with projects ranging from new builds to large remodeling jobs to yachts. She works with a wide range of clients including high-end developers needing guidance in the luxury market to home owners looking to create more than a home, but an art piece. Give Meredith a call to discuss your project and join her growing portfolio of sports luminaries, cabinet level government officials, and South Florida's pedigree families. Whether a simple décor update or a whole-home renovation, we approach each project with creativity and enthusiasm. A good home design professional will hone your style down to its very essence and be able to choose a functional layout that feels natural to you. Interior design companies can be involved as much or as little as the client desires. Many clients who hire an interior decorator in Fort Lauderdale, FL — particularly those who are remodeling — have a good sense of how the room should look and what products they should use. Often clients will insist that interior decorators use the products already present in the house. Other times a designer will need to start from scratch — especially if this is a newly purchased or just-built home. An interior design company will need to figure out exactly what the client needs, which includes organizing rooms, picking flooring and wall colors, and finding furniture to complement it all. Sometimes that means he or she will have to recruit help from other Fort Lauderdale, FL home professionals to help create the perfect look for your renovation. Here are some related professionals and vendors to complement the work of interior designers & decorators: Architects & Building Designers, General Contractors, Home Builders, Design-Build Firms, Photographers. Do your research before meeting with an interior designer or home decorator in Fort Lauderdale, FL. Ask yourself what you want your space to become and what it will be used for. Figure out the extent of what you need help with, what your must-haves are and what your budget is. Interior design services can add up fast, so be up front with a potential design firm or individual from the beginning. Also, pick an interior decorator that fits your style. Browse through the portfolios of different Fort Lauderdale interior design firms and decide if you would live in those houses. Just because you like something doesn’t mean you could live in it. There's a big difference! Find an interior designer or home decorator in Fort Lauderdale, FL on Houzz. Narrow your search in the Professionals section to find Fort Lauderdale interior designers near you. You can also look through Fort Lauderdale, FL photos to find a room you like, then contact the design firm who designed it.